This three bedroom property is one of our El Camison townhouse rentals. It has wifi internet access, international TV and a washing machine. Location location location! The 3 most important factors in a holiday. We booked a three bedroom townhouse through Karen Durant from Holidays 4U. It is just on the border of Los Cristianos and Playa de las Americas and is there in the perfect position. It is also close to the sea front and Las Vistas beach. You can therefore walk along the sea front promenade in either direction to the centre of Los Cristianos or to the posh part of Playa de las Americas, where all the top restaurants, bars and shops can be found. There is also a fantastic supermarket very close by, called the Mercadona. The fresh fish here is particularly good. 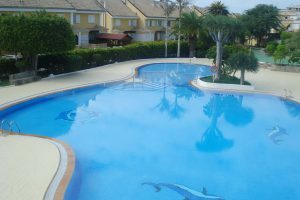 The complex itself has a pool which is shared. The terrace faced towards the inside of the complex and was well equipped with patio table and chairs as well as reclining chairs. There was even a washing machine under a covered part of the terrace. The stone barbeque was also fantastic. It was our favourite thing to buy some fresh prawns with shell on, from the Mercadona and to cook them on the barbeque for our evening meal. The fish is so fresh that it is even labelled with the time when it was caught! The townhouse was spotlessly clean when we arrived. We loved the decor, being slightly rustic and seemly more in keeping with a local style, rather than just being a copy of every modern apartment these days. It was a bit more individual, which was nice. In our opinion this townhouse would be ideal for a large family, as it actually has beds for 8 people. The bedroom on the top floor is very large with a double and 2 single beds in it.